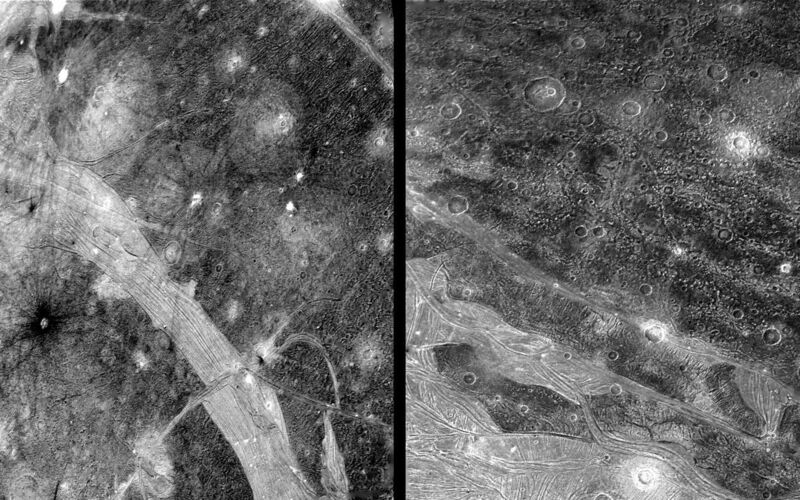 RIGHT: This picture shows part of the surface of Ganymede as viewed from a range-of 120,000 km by Voyager 2 on July 9th. In the foreground is typical grooved terrain as seen by Voyager 1. It consists of mutually intersecting bands of closely-spaced, parallel ridges and grooves. 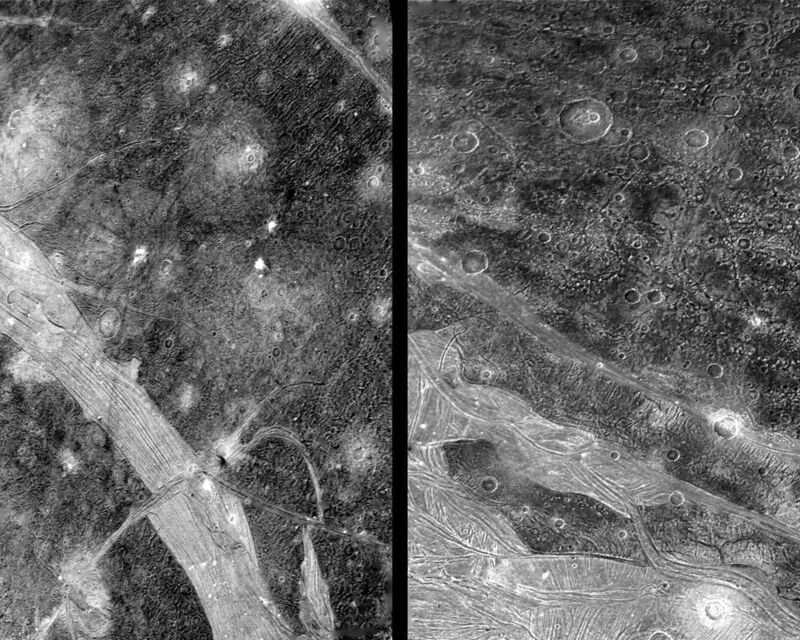 In the background is newly-cratered dark terrain across which can be traced several widely spaced parallel linear features. When viewed from a distance the line features appear to trace broad circular areas. The features resemble the circular ridges on Callisto that surround an almost completely annealed impact basin. 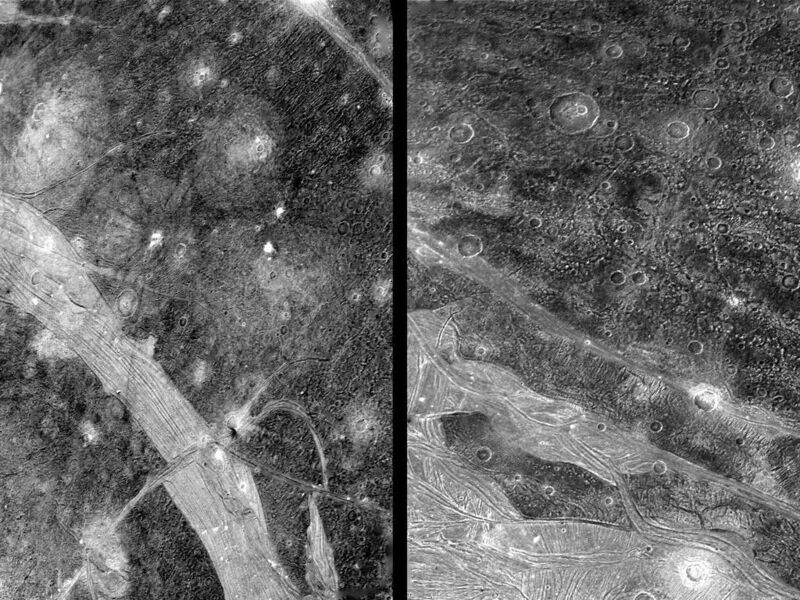 The feature on Ganymede may be of similar origin but all traces of the impact itself have been destroyed. LEFT: This picture of Ganymede was taken at a range of 169,000 km by Voyager 2 on July 9th. 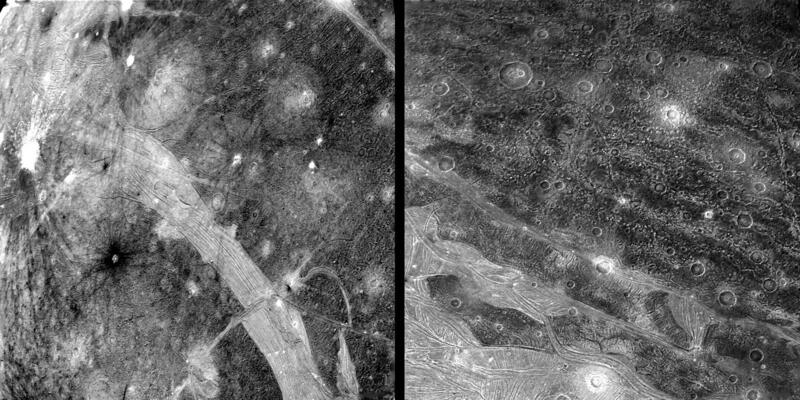 Dark contrast terrain is separated by bright bands of grooved terrain. The band of closely spaced linear grooves in the foreground is 150 km across and appears to be offset by another narrow band at right angles, as though by faulting. A variety of ray patterns are seen around craters. One is the left of the picture, it has prominent dark rays around an inner bright halo. Other craters have dark haloes; other have diffuse bright rays. The variation is albedo patterns around the craters may be indications of layering in the surface materials. The intensity of craters suggests the dark areas are extremely old. The bright grooved terrain is less cratered and probably somewhat younger.